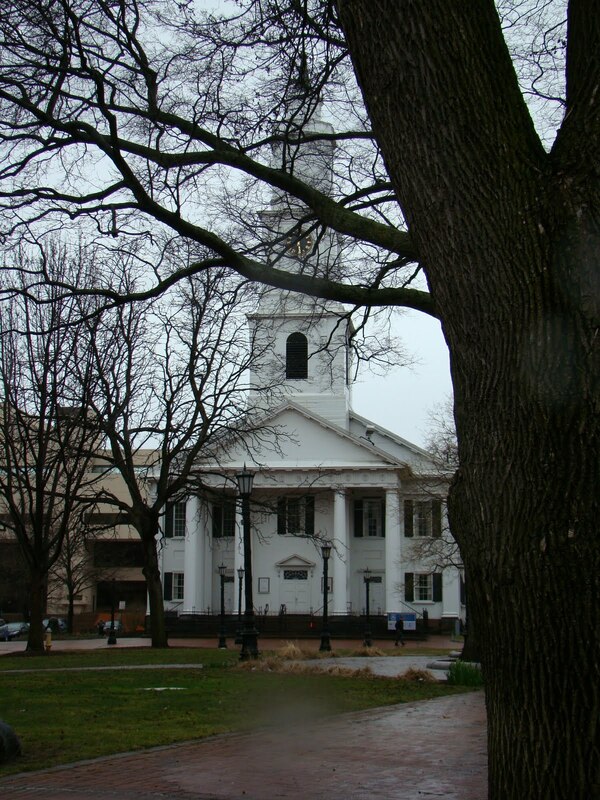 I left Enfield, Connecticut and headed for Springfield, Massachusetts. 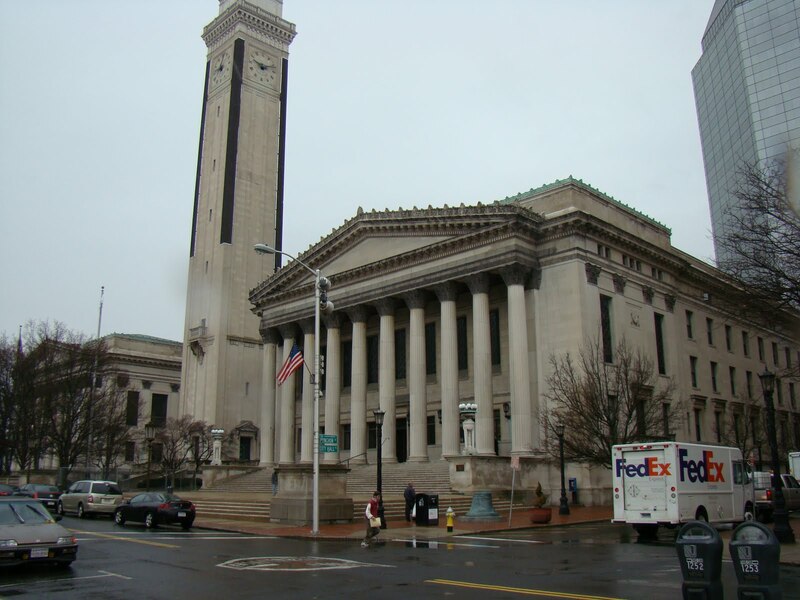 My goal was to be in Springfield for the New England Regional Genealogical Conference http://www.nergc.org/ which I will be attending. 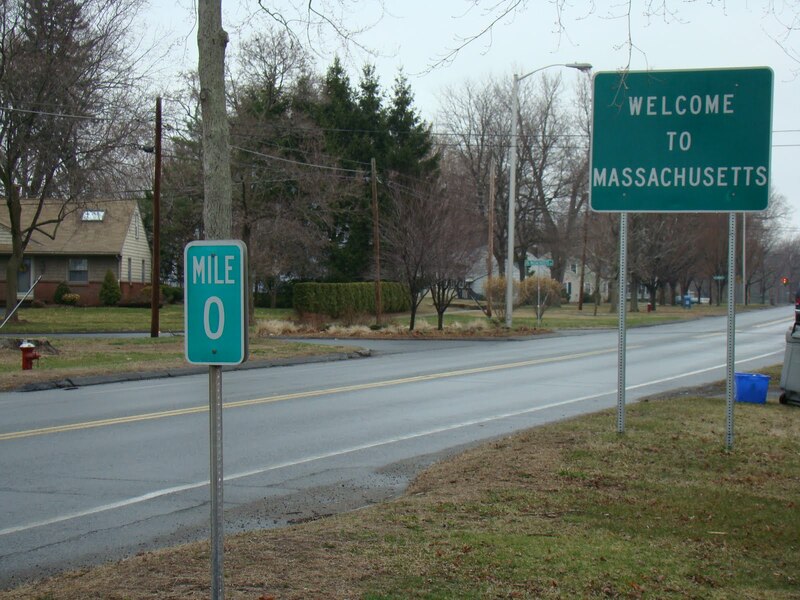 I like to drive on the regular roads rather than the freeway so I headed up Hwy 5 to Longmeadow crossing the state line into Massachusetts. It truly is a “long meddow” for the town is long north to south. The street has this very wide green grassy median in the middle. 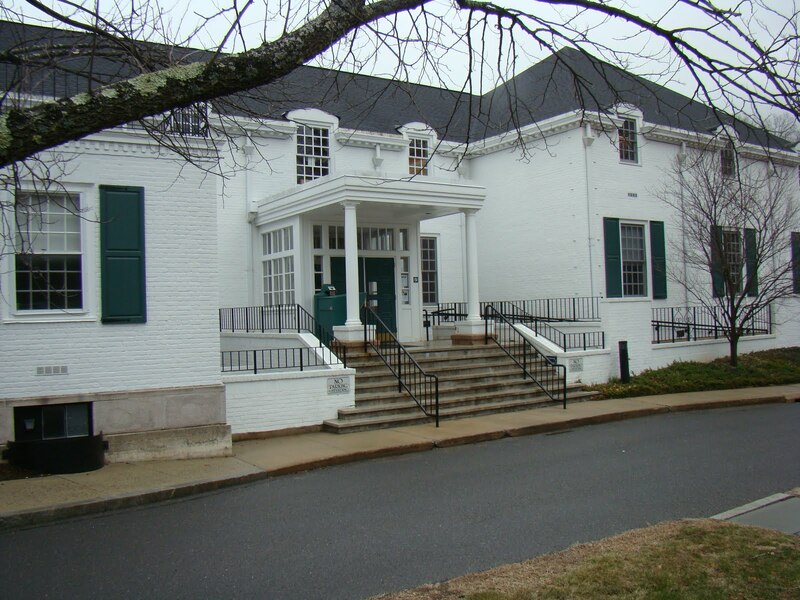 In April 2007 I stopped at the Longmeadow Historical Society and had a nice chat with the curator Linda Abrams. She talked about the Cooley family while she searched through wonderful old deeds. http://www.longmeadowhistoricalsociety.org/#storrshistory She sent me a history written by one of her interns about the Benjamin Cooley family. I also came away with a wonderful map: Plan of Longmeadow, Mass showing the Original Land Grants Along Conn. River. Original Lots on Longmeadow Street. Land Ownership During Railroad Construction, Nov. 1965, Robert T. Bitters. Ms. Abrams said the towns people had to move the town upland because of the flooding. 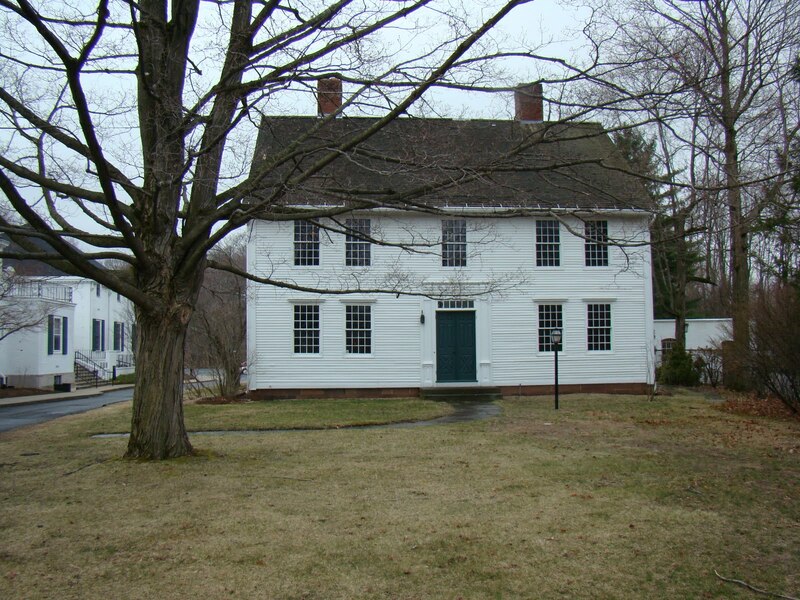 It was a lovely day spent at the Longmeadow Historical Society. My advise is to make an appointment with specific information, Ms. Abrams is a busy person. I saw her name on the list for the Ancestor Roadshow for the New England Regional Conference. Comparing a map of today with the map of the past I drove along Longmeadow Street and the streets signs read: Cooley, Stebbins, Bliss, Colton, Miller, Sikes, Burt and more lived right along this road. I thought I knew what the Longmeadow Historical Society looked like but I flew right by and ended up in the Forest Park Entrance. The gates were closed. 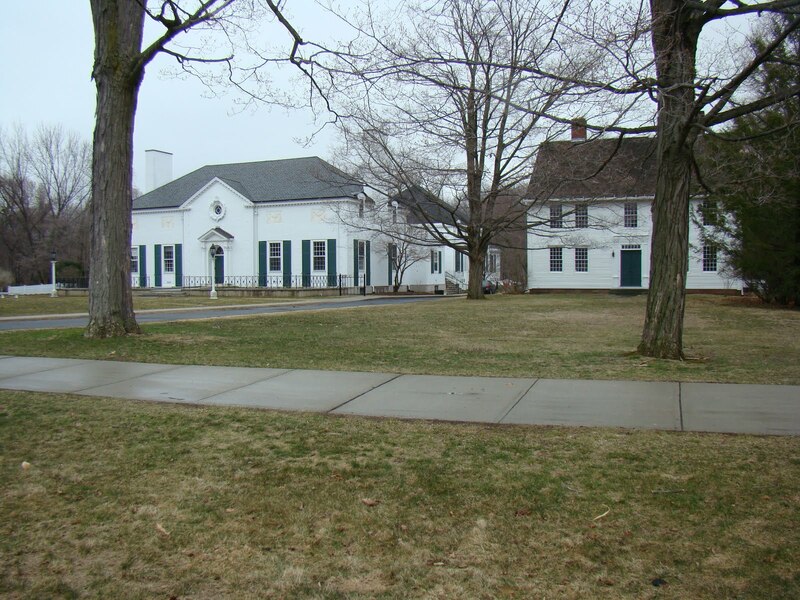 So I turned around and headed back to Longmeadow and was determined to find the society and library. I finally spotted the signs which are about 2 ft x 2 ft. 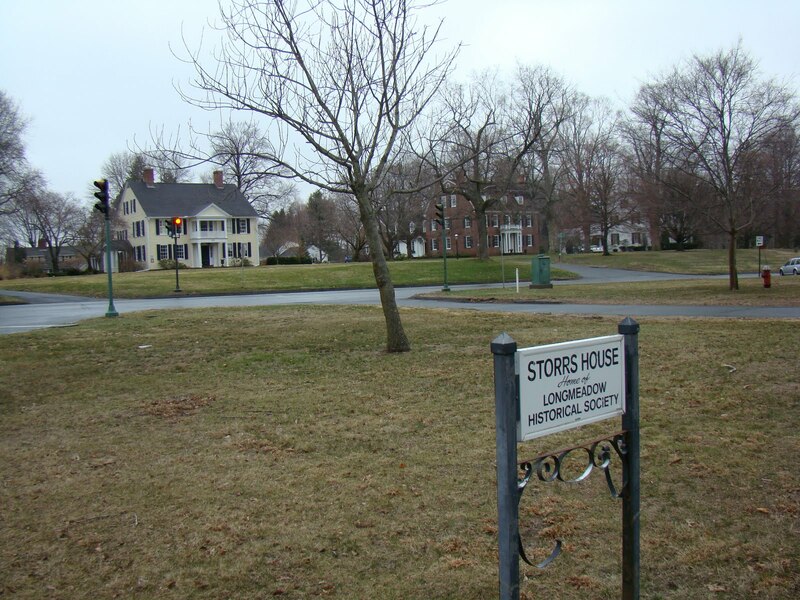 There is a stop light with a little side road that takes you in between the library, which is a white building, and the Storrs House which is where the Longmeadow Historical Society is located. Once there I recognized everything and parked in the lot between them. The library might have topographic maps and so I went in to check that possibility out. No luck. Oh they did have topo maps but not Massachusetts. Hmmm…….???? 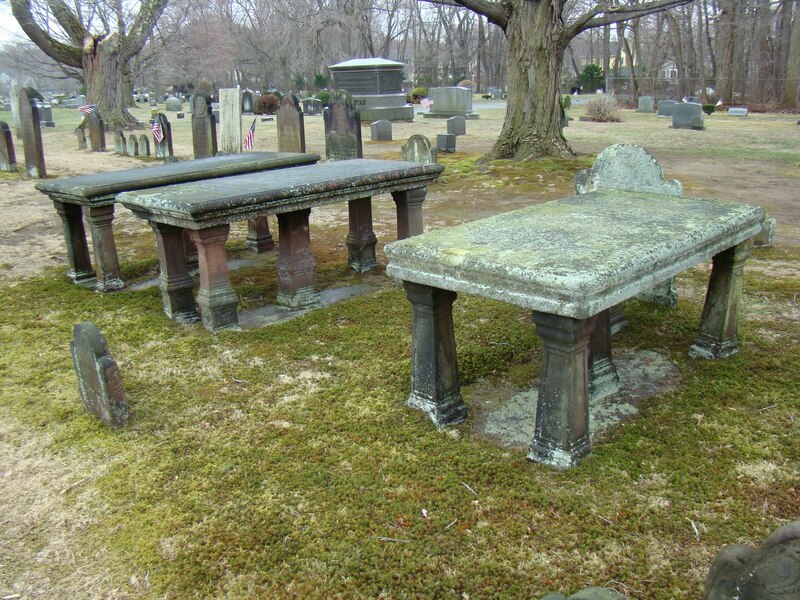 My next goal was the Longmeadow Cemetery but I had forgotten where it was and I did not see it from the street. 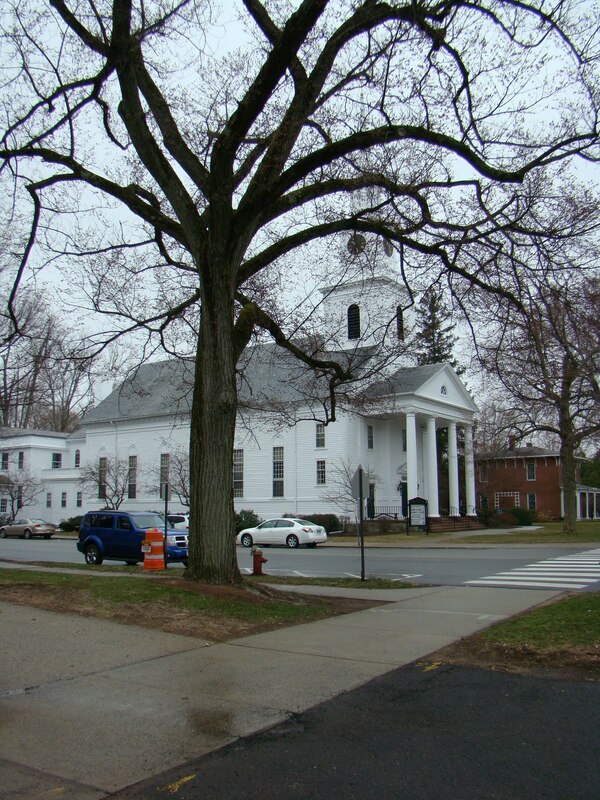 So I walked south down the sidewalk from the library and saw the big white church with the tall steeple and remembered instantly that the cemetery was behind the church. 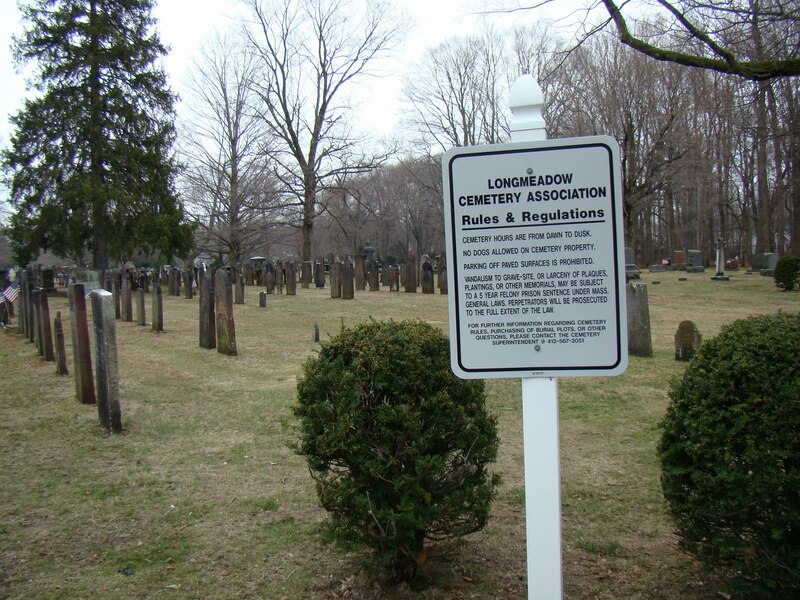 The first impression of the Longmeadow Cemetery is that it is long and thin but this is not true. This cemetery is much bigger than it looks. The size is like a big L shape. 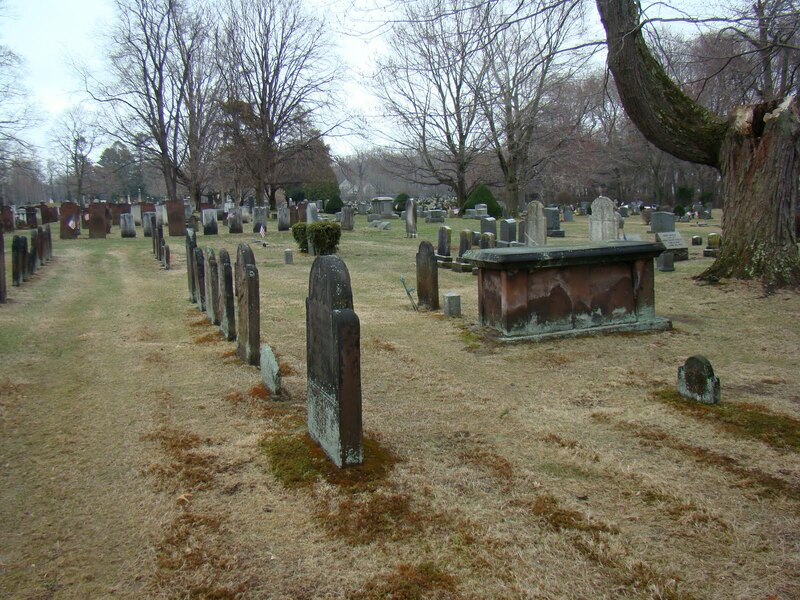 It is well kept and parts are very old but it looks to me like it is still a usable cemetery with newer tombstones. Benjamin Cooley (immigrant) lived from 1617 to 1684. 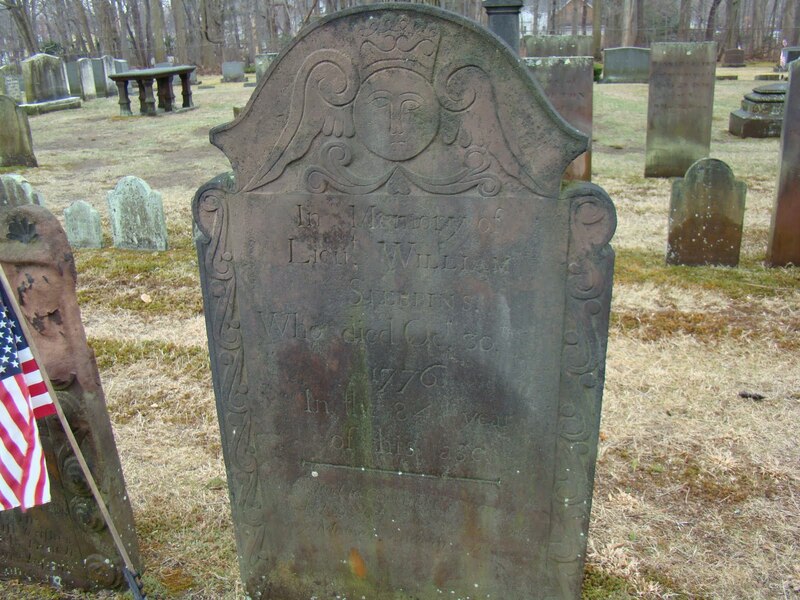 There is a reference to a Benjamin Cooley on the map but it has 1703 written by it so this must be the son who owned land next to the cemetery and perhaps a portion of it. 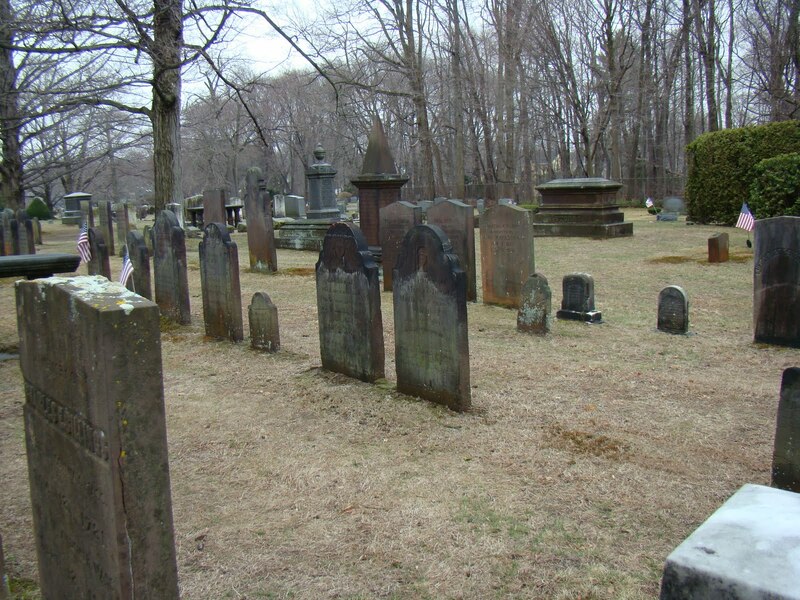 Be careful when you use Interment and Find-A-Grave they could be incorrect or incomplete and therefore you need to check them with another publication if possible or verify the burials in that cemetery with the cemetery office or town hall. These are only some of the photographs I took of this cemetery. I will share more later. 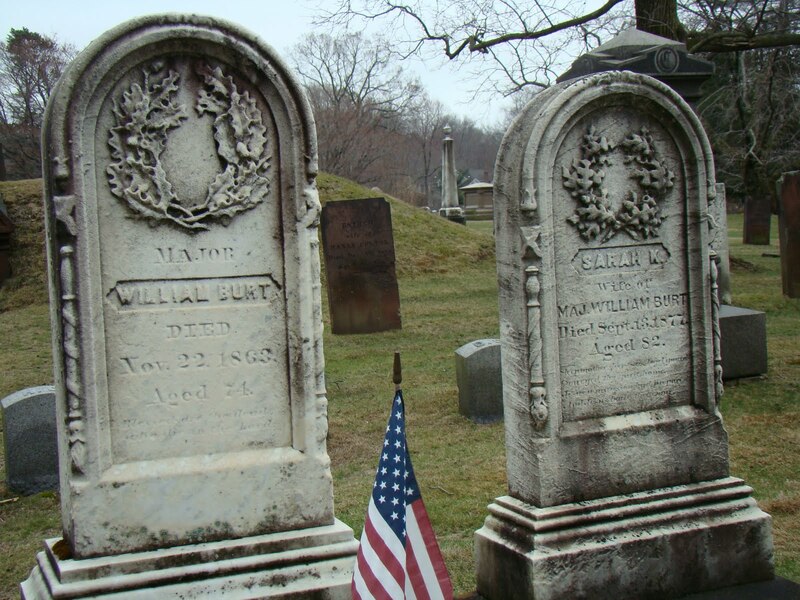 Benjamin (the first) and Sarah’s son Daniel married Elizabeth Wolcott, daughter of Simon and Martha (Pitkin) Wolcott. Daniel and Elizabeth had a son named Benjamin. 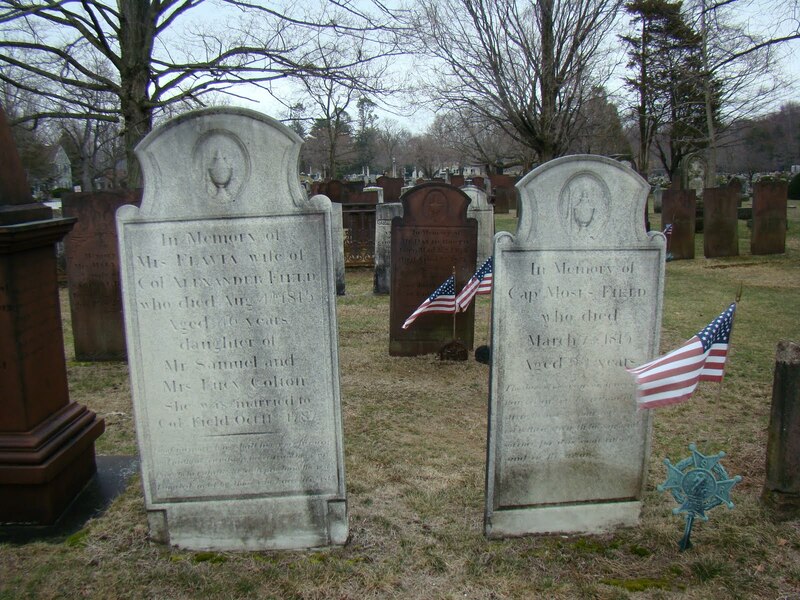 Benjamin and his wife Margaret (Bliss) Cooley had a daughter named Keziah and she married Philip Goss (III) on the 25th of Nov 1723 in Brookfield, Massachusetts. Somehow this marriage between Philip and Keziah had to take place so Keziah’s must have moved with her family to Brimfield or Brookfield in order to meet Philip Goss (III). Ms. Abrams made a comment about this at our meeting. My preliminary findings are leaning in this direction. Apparently, Springfield was established first at Agawam in 1635 by William Pynchon (Wikipedia) and from it the settlers radiated out to locations like Brimfield, Montague (north) and Northampton also north of Springfield. Pynchon’s last name is not pronounced as you think. I will have to get back to you on that for I am still learning how to speak Massachusetts and it takes awhile. The Pynchon family is very big in this area and even in the Brookfields. Longmeadow Town website: http://www.longmeadow.org/ This town hall is directly across from the Longmeadow Cemetery and it looks like someone’s house. There is sign that has the hours of the Town Hall on the door. Using the map of the Old Longmeadow I tried to see if I could find Pondside Street and West by using Birni Street and turning west and ended up next to the freeway in a round about. I decided I needed more information before I wandered around too much. Since the Forest Park gates were closed I couldn’t go in and check out this huge park south of Springfield and decided to try Converse to Dickinson to Mill to Main to get into Springfield. The librarian said that it would work when I told her my plan. She also explained that I didn’t have to get on the freeway just keep to the right. I didn’t want to chance getting myself stuck in a wrong lane. 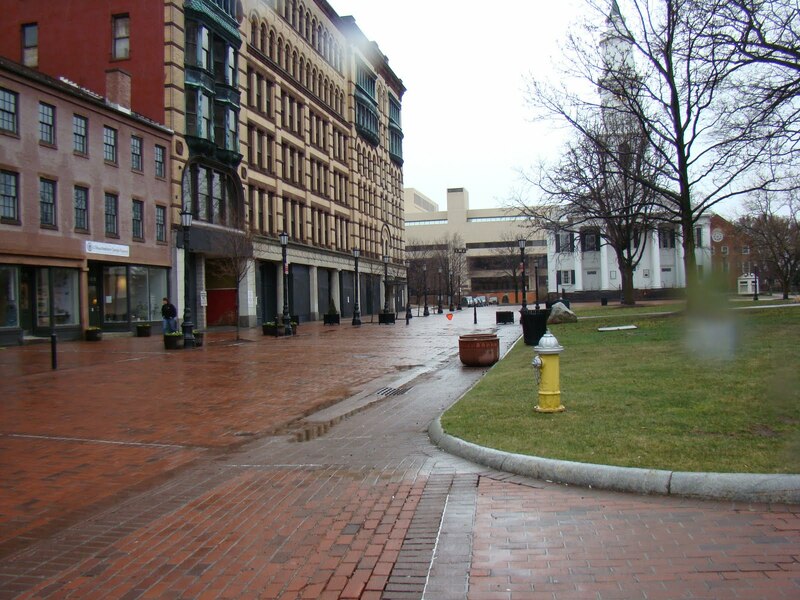 My route worked and I was soon in downtown Springfield making my way around the streets. I was not having much luck trying to figure out the parking to go to the Registry of Deeds in the Hampton County Courthouse at 50 State Street. So I decided to head for the Sheraton and see if a room was ready or at least park my car and walk to it. Finding the Sheraton was going to prove to be a little confusing and I missed it the first time spotting the Marriott sign too late. Two times around the block finally got me to the entrance to the Sheraton. Fortunately, they had a room ready and I was able to check in and get my luggage and park the car. Once all that was done I headed to the Court Park area. 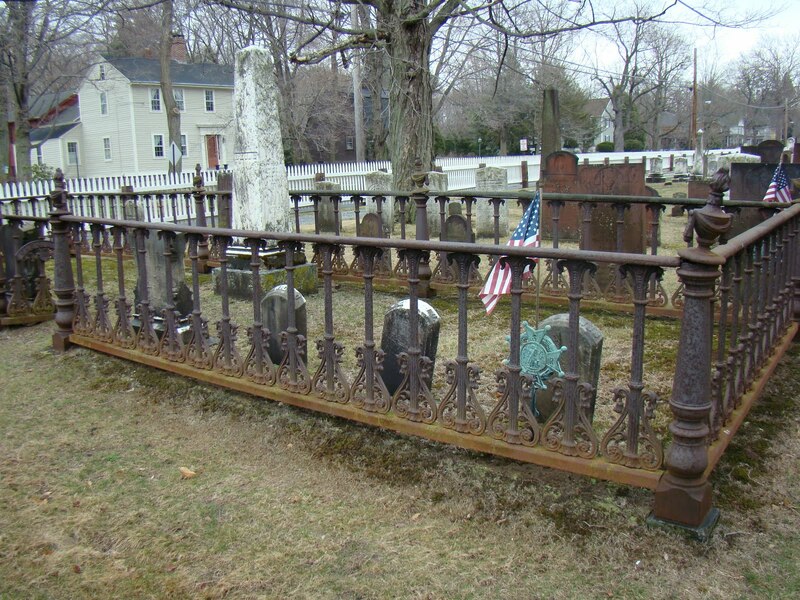 Ms. Abrams told me about the cemetery in Springfield where a lot of the old pioneers of Springfield and Longmeadow had been buried but the railroad came and the bodies were moved to the Springfield Cemetery about 1845-1848. As many bodies as could be found for time had pretty much turned them to dust. 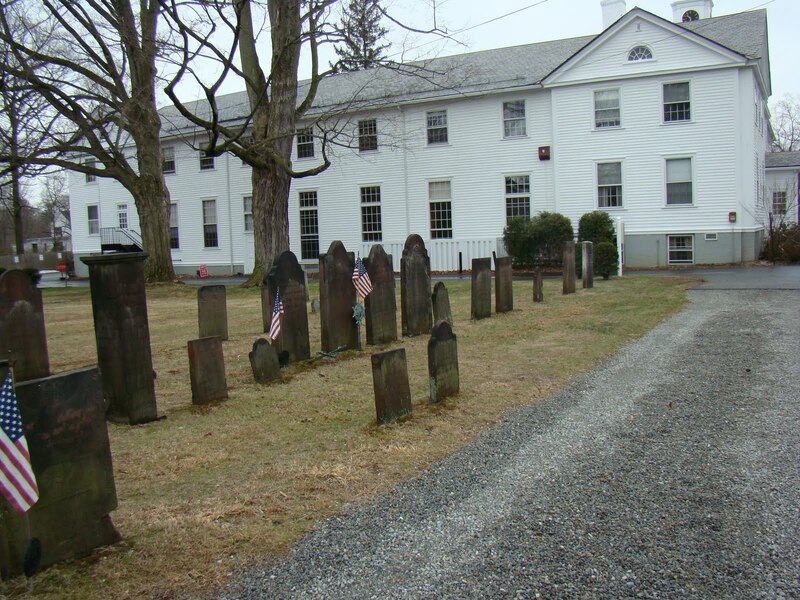 The cemetery that is right there next to the Longmeadow Museum – Storrs house is not the older pioneers. 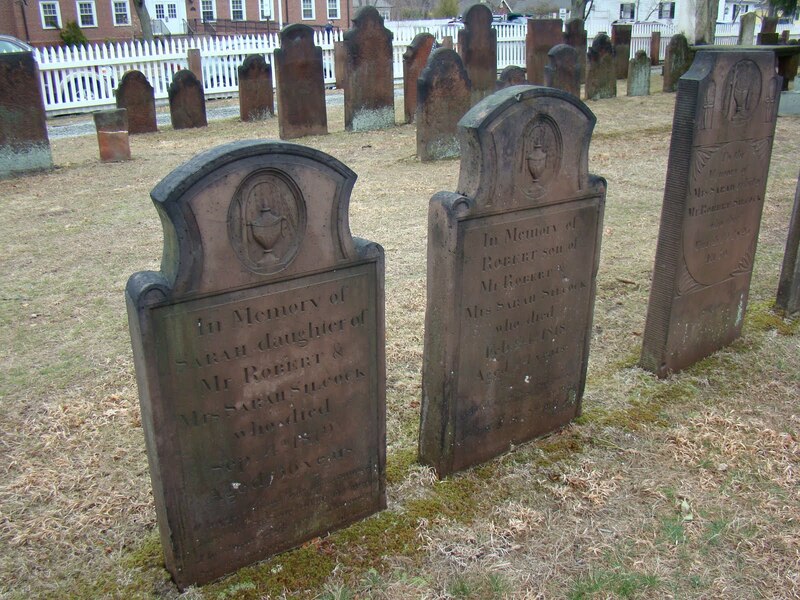 According to my calculations the old pioneer cemetery was at the end of Elm Street by the Connecticut River. It is long gone now for there is freeway (Hwy 91) and the train tracks. 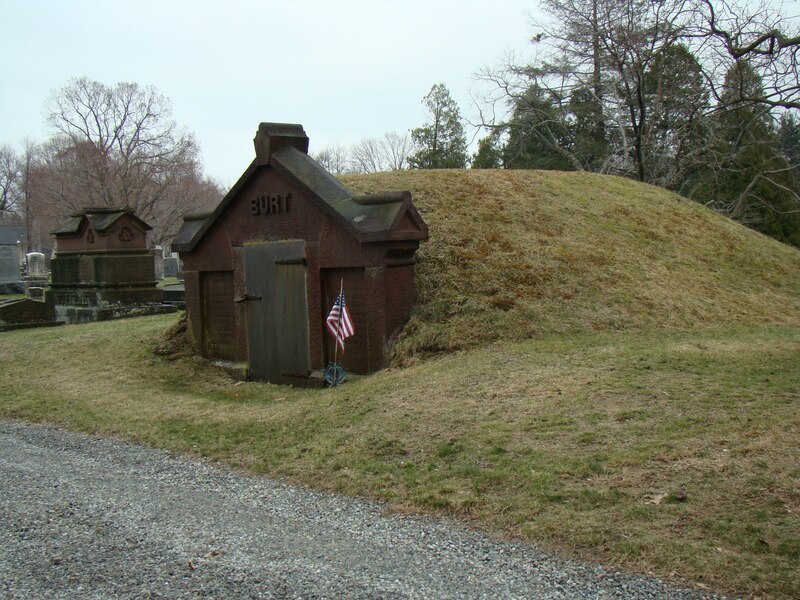 I studied the Court Park area and could find no memorial plaque or anything stating that the cemetery had been there. Most of the monuments were for veterans of past wars in this century or the last. There is no sign for the street called Elm in this area but there is evidence that a street might have been there? 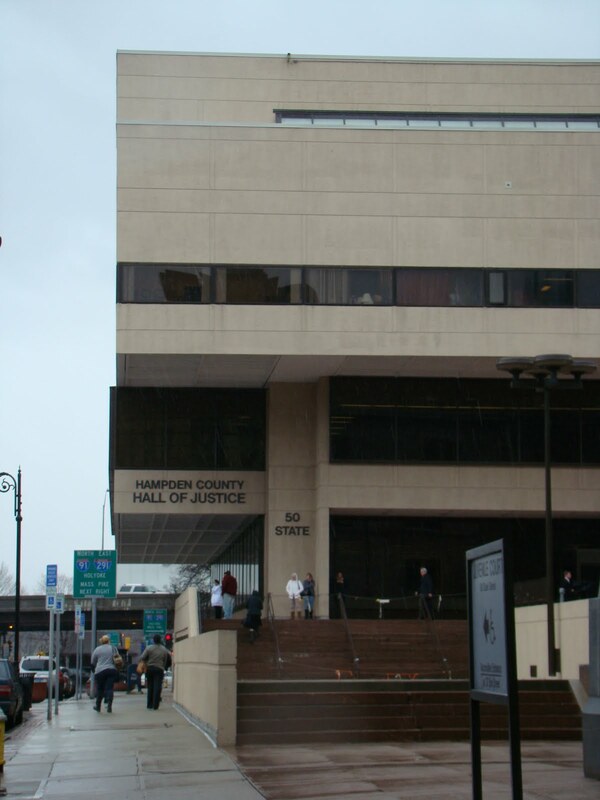 Once my curiosity was satisfied I headed to State Street and turned west and spotted 50 State Street which is the courthouse. It is a modern looking building with straight lines and probably light brown or dark tan? I entered and had to go through security giving up everything but my shoes. Once through the line I had trouble figuring out where the elevators were and how to get to the fourth floor. A nice lady helped me. Once in the lobby go left into the hallway and they are there on the left a little recessed. The building smelled. The people were very interesting but it was no worse than the King County Courthouse in Seattle. One young girl was yelling in her cellphone about….a child? I think they were fighting over custody?? The Registry of Deeds for Hampden County was a big room, tidy, and organized and rows of deed books. There was a receptionist and when I explained I needed old deeds in the 1700’s she told me to go to where the clock was (Administration) and they would help me find the Registry Annex. After a nice chat with the assistant in the Administration area I was taken downstairs to the basement and through some doors passed the lunchroom and into a small door and I was in the deed annex. A young man greeted me and I assumed way too much and thought he would be able to help me. I think I scared him when I did ask him what to do? He headed for the computer and I knew that was not going to help me. The deeds online go back to about 1954. He didn’t find the names I had given him and was not happy with my lack of specific dates or an address??? 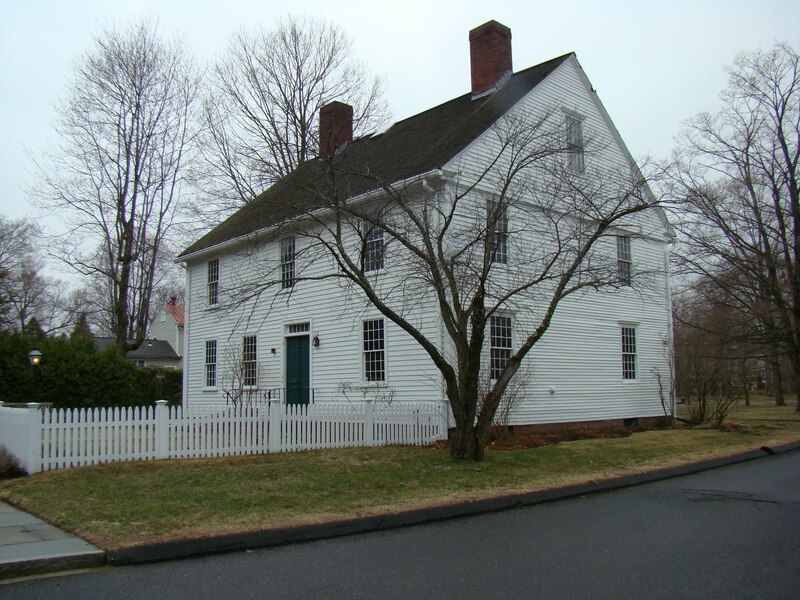 Hmmm…I don’t think they had addresses in 1754 in Granville (Bedford Farms). I asked if there were indexes and he took me to the grantor and grantee indexes that were part of this long table. They were underneath. We started with Book O at the end on the right for grantors if you are facing the back of the room and grantees are on the left. I set to work after he found Philip Goss in the book. That seemed to calm him down some. He still had attitude though. Fortunately another young man came in and he was the official attendant. He had been on break. He was very nice, shook my hand and introduced himself. I proceeded to take notes from both the Grantor and Grantee indexes for the names of Goss, Cooley, Gibbons, Haskell, Brown. The indexes were copies not the original deed index books. Apparently they used to allow access to the originals but not anymore. Once that was done I started to pull the books and search for the pages. I concentrated on Philip Goss, Thomas Goss and anyone who did business with either. There were too many to look up so I had to focus on Philip Goss. I will prepare a table of my findings and add that later. There may be additional information from another source to add to it. The nice young attendant was helpful and made the copies. He did a very good job and was genuinely interested in making the copies good so I could read them. Photography was not allowed. I kept pulling books of the older records along the wall of the annex next to the copy machine. They were charging a $1.00 a page. So if a deed was on two pages you get my drift. I made quite a few copies more than they were use to. I was so excited to find Philip Goss’s name in the Hampton County deeds. I moved fast and will have to study them more thoroughly but I think it is going to be really cool. There was actually a deed involving a Comfort Goss? The deeds were not the original clerk books but copies of the deeds. I paid my copy fees, thanked the assistant and headed out. Now that I knew my way around it was easy to get out of the building. The building actually faces east with the stairs descending into the southwest corner of the Court Park. So I could have cut through if I had realized the locations. ﻿Back to the Sheraton in the rain but it was not too bad except for the puddles. Tonight it was dinner in the Sheraton and settling in. The conference starts on Thursday but I have some things I want to do in Springfield and Granville tomorrow.